Ingredients: Banana Flower, Shallot, Coconut Grated, Green Chilly, Turmeric, Vegetable oil, Salt, Mustard and Curry Leafs. 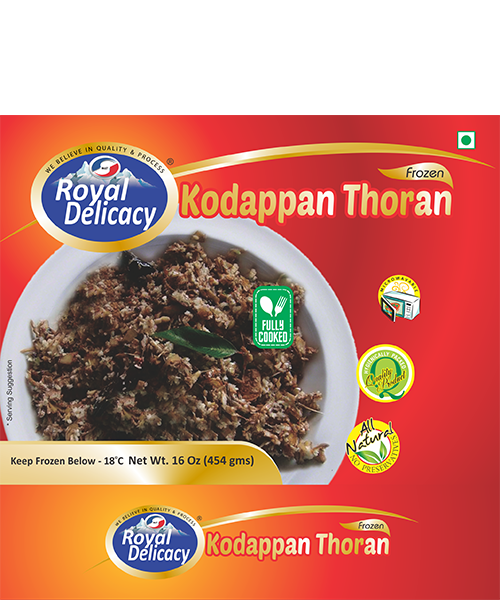 This is to declare that Kodappan Thoran is prepared by the following procedure. Remove the outer layer of the flower until get a plain white flower and chop the florets well, soak the florets in water and drain out the water well. Cook it with the mixture of onion, coconut and turmeric powder. Then pre-cool the product before blast freeze at -32 °C and pack and stored at – 18 °C. The procedure is carried out so as to assure that the product is free from any type of contamination.